Selling shaved ice from your very own, self-contained concession trailer gives you the freedom to go where the crowds are. We offer turnkey, mobile trailers that are fully equipped and ready to serve (see trailer photos). Just hook one up to your pickup, drive to a fair, festival or event and you're in business! 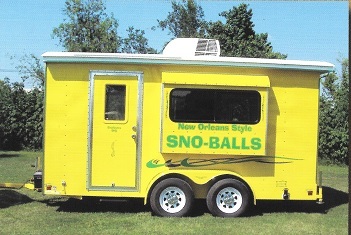 Once you own a trailer, you're free to earn money selling snow balls / shaved ice / snow cones as you please. Work special events, run a route, sell seasonally; it's your decision because YOU are the boss. Naturally, there are no franchise fees either. Fill the freezer with ice. Plug the trailer into a 110 volt outlet overnight.. This will run the 110 volt freezer all night, keeping the ice from thawing. Run the 110 volt water heater. Charge the snow ball machine 12 volt battery. Fill the potable water tank with water. The next day unplug the trailer. During the day, the freezer will act as an ice chest, keeping your ice cold. There are 2.5 gallons of hot water in the hot water heater tank, providing hot water to all four sinks (a requirement of most health departments). The overnight charge to the 12 volt snow ball machine battery will provide enough electricity to make 800 10 oz. snow balls on one battery charge. Since you need no external power source during operation, you can sell snow balls in a blackout and there is no setup time. Every trailer has an air conditioner. To run the 110 volt a/c, you need to plug in the trailer or pull the trailer with a pickup truck that has a generator in the pickup bed for a power supply. 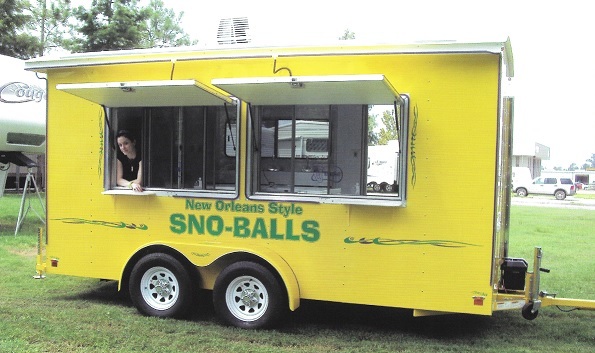 The 6' x 10' trailer has room for 1 person selling snow balls. 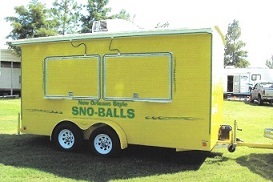 The 6' x 12' trailer has more room for selling snow balls and an additional 25"x25" stainless steel counter for simultaneous preparation of another sales item. 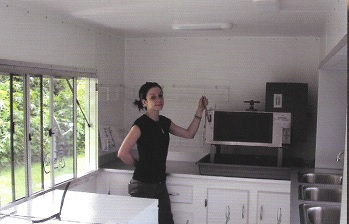 The 6' x 14' trailer has two serving areas and two serving windows for sales of multiple items. The versatility of this trailer lets you serve snow balls or items from both windows simultaneously or use one window to place orders/collect money and the other to serve your products to customers. The regular roof height is 6'4". With lights & the a/c unit hanging down, this provides a 6'2" clearance. The raised roof is 4" higher (6'8") and costs an additional $400.00. NOTE: The raised roof is standard on 6' x 14' trailer. Chaser lights around both sides of the trailer and serving window cost $375.00. Chaser lights run on 110 volts and require an external 110 volt power source (such as a generator or utility hookup). For more about our portable concession stands including pricing, see the information listed below. We offer 3 trailer sizes and a variety of optional add-ons (snow ball machines, electric brakes, undercoating, chaser lights, etc. ; (for the complete option list, click Trailer Pricing below) so your trailer can be custom outfitted with the exact options you need. If you need a trailer immediately, we always keep a variety of trailers in stock ready for you to drive away usually with; just hitch up and go.